Apparently there was a massive blast in a fertilizer plant in Texas just yesterday. Unknown number of casualties as of yet, but the local media's estimates are appalling. No indication yet as to whether the fire that caused the blast was accidental. Very dark days for our american friends. 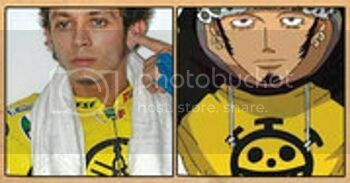 I don't know if it has been already mentioned, but Eichiiro Oda, the creator of One Piece based one of his characters (Trafalgar Law) on Valentino Rossi. Now that you mention it... I'm a fan of One Piece but I hadn't made the connection! The scene of Pepper with Tony’s helmet, according to screenwriter Drew Pearce, was inspired by the heart-wrenching real-life scene of famed Brazilian Formula One race-car driver Ayrton Senna’s sister, Viviane, embracing his helmet at Senna’s funeral in 1994.
Pepper Potts is Tony Stark's lover in the Iron Man movies. And that scene is from Iron Man 3. I guess I left this information out. Oops. I didn't see this movie yet, but Gwyneth Paltrow is one of my favourite actresses. Talking about movies, you should see the imposter, it's really nice! iceman1 wrote: Talking about movies, you should see the imposter, it's really nice! Now You See Me was the last movie I saw. That was good as well. I see you are a lot of free time in your hands no more exams? I finished my semester in mid-June. So, no more school till September. Last edited by Treacle on 11 Jul 2013, 14:26, edited 1 time in total. Is that your final year? You are studying psychology or something like that right? What do you think of Joey's personality ? Are you going to the Hungarian GP? Well, the upcoming semester is my last in the Bachelor. After that I'll still have 2 years of MSc. So I'm far from leaving school. Uhm, nope. I study biochemical engineering. So I'm not qualified to answer that question. As of now, it seems like I'll be going on Sunday. Can't wait! Last year I went for all three days + the pitwalk. Enjoy it then take a lot of pictures. BTW, who is your favourite driver? I think it's Vettel? You're right, it's Vettel. Taking quite a lot of c**p from my friends for it.